Ask any parent and they will tell you that raising a child is one of the most rewarding things they’ve ever had the pleasure to experience. Although it’s a “job” that’s filled with sleepless nights, eternal stress, busy schedules, constant ferrying to sports- or friends-related activities and cleaning up endless messes, it’s something that they wouldn’t trade for the world. A parent’s love for their child is immeasurable, and finding out that their kid is ill, gets diagnosed with a disability or needs to undergo life-changing surgery can be their worst nightmare. However, for the sake of their children, parents somehow find the strength to move forward and be there for their child. This is especially true in the case of children who have suffered through a life-saving amputation. Will they be able to keep up with their peers? Are they more prone to injury? How will this affect their self esteem? How will they be treated by other kids? 1. Prepare Yourself and Your Child: Regardless of one’s age, losing a limb is a radical life adjustment, not only for the amputee but also for the people around him/her. Along with the emotional and mental acclimation, the physical adjustment of learning how to use, care for and maneuver a prosthetic requires a wealth of patience and support. As a parent, the best thing you can do for yourself and your child is to get ready for the long road that’s ahead of them while remembering that although there will be challenges, life isn’t over. Remember: Positivity is key and you’re a role model for the attitude they’ll take regarding their situation. The more positive and happy you are, the more your child will be, as well. 2. Know that Education is Key: Educating yourself, your family and your child about the impact of undergoing an amputation is a very important factor in the overall goal of helping you and your child cope with their limb loss. ....but also highlight the need for normalcy and that they should not be treated any differently than the other students. Separating rather than including them in common activities will only hurt them. 3. Have a frank discussion with your child about expecting varied reactions from kids and adults alike: Unfortunately, bullying is something that occurs far too often – even to children without any disabilities – despite a school’s greatest efforts to squander it and the social awareness being brought to this behavior in recent times. Though we hope and pray our children never experience that type of torment, it’s something that’s out of a parent’s control. Teach your child the best ways to deal with the questions, stares or negativity that might come from other people. 4. Encourage your child to talk about their thoughts and feelings: Many adults – having the best intentions – downplay or ignore a disability in an effort to take the focus elsewhere and/or as a way to give encouragement. Allowing your kid to be open about what they’re feeling provides the opportunity to address their fears and find ways to conquer them. 5. Establish a Support System: Constantly showing support throughout your child’s journey with the loss of a limb is absolutely crucial. Additionally, there are several support groups that you and your child can join, such as the Amputee Coalition of America (ACA) or the Association of Children’s Prosthetic-Orthotic Clinics (ACPOC) or through a local group on the Raleigh area. Parents can also invest in a variety of children’s story and coloring books to help your child better understand limb loss. Sometimes, just knowing that they (and you) are not alone and being able to interact with others going through a similar experience is the best medicine for self-acceptance and confidence. 6. Remember to Take Care of Yourself, Too: Your reactions and attitude will set the tone for this entire situation; therefore, make sure you take the time to take care of yourself. Whether it is talking to a professional, educating yourself more on your child’s situation, or finding solace with a spouse or family member/friend, find something that will bring you the strength needed to help your child through this time. At Beacon Prosthetics & Orthotics, our entire staff is committed to helping patients achieve comfort and mobility and live a life without limitations. We stay on top of advancements in technology and have a wide range of prosthetics to ensure we're providing you with the best device for your needs. Read more about us and our staff, and contact us at any of our 3 locations to make an appointment or ask a question. 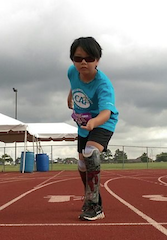 While having a child with an amputated limb is never a desirable situation, keep in mind that children are astonishingly resilient and adaptable....just because your child has a disability, it doesn’t mean that they are forever disabled. What might seem like the end of the world to you may end up being nothing but a blip on their radar after time. With time, they will flourish.